The Saint said, "Who are you? And why have you come here?" The devil answered, "I am a wicked demon and have come to trouble you. I thought that since you are a man, you would take fright and desist from prayer, but instead you have confined me to this vessel, and I am grievously tormented. Woe is me! I was deceived in coming here! Release me, servant of God, and I shall not come to this place again." When the demon had cried out for a long time, the Saint said, "For your shameless boldness, I order you to carry me this night to Jerusalem and to take me to the Church of the Holy Sepulcher of the Lord. Then bring me back tonight to my cell, and I will release you." The demon vowed to do the will of the Saint, if only he would be released from the vessel. Setting him loose, the Saint ordered the demon, "Be like a horse standing before my cell so that when I have mounted you, I may fulfill my desire." 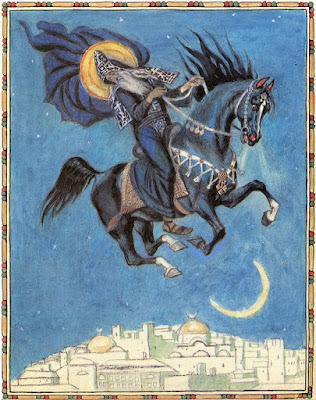 The demon fled like the night from the vessel, and he stood as though he were a horse before the cell as the Saint had commanded. The Saint left his cell, arming himself with the Cross, and sat upon the demon. He arrived that night in the holy city of Jerusalem, near the Church of the Holy Sepulcher, where the Tomb of our Lord is to be found. He forbade the demon to depart from that place, and so the demon stood there, unable to move, until the Saint had venerated the Sepulcher of the Lord and the Honorable Wood of the Holy Cross. As he approached the church, he knelt before the doors and prayed, and immediately the doors opened by themselves, and the candles and lamps at the Tomb of the Lord were lit. The Saint prayed to God with thanksgiving, shedding tears, and he venerated the Tomb of the Lord, kissing it, as he also did the Lifegiving Wood and all the sacred icons and holy places found in the church. When he had completed that which he desired, he departed, and the doors of the church locked themselves. The demon was still in the place where he had been commanded to remain, standing like a horse. The Saint then sat upon him and returned to his cell in Novgorod the Great. As he parted from the Saint, the demon charged him to tell no one that he had been bound by an oath to serve him like a captive. "If you tell anyone that you have ridden me," he said, "I will not rest until I have succeeded in bringing great temptations upon you." The Saint made the sign of the Cross upon himself as the demon boasted thus, and the demon immediately vanished like smoke before him. One day, as the Saint was engaged in spiritual conversation with men of honor, with the abbots, priests, and the God-fearing citizens of Novgorod, relating to them the lives of the saints and exhorting them with many edifying tales, it happened that he told them what had happened to him. 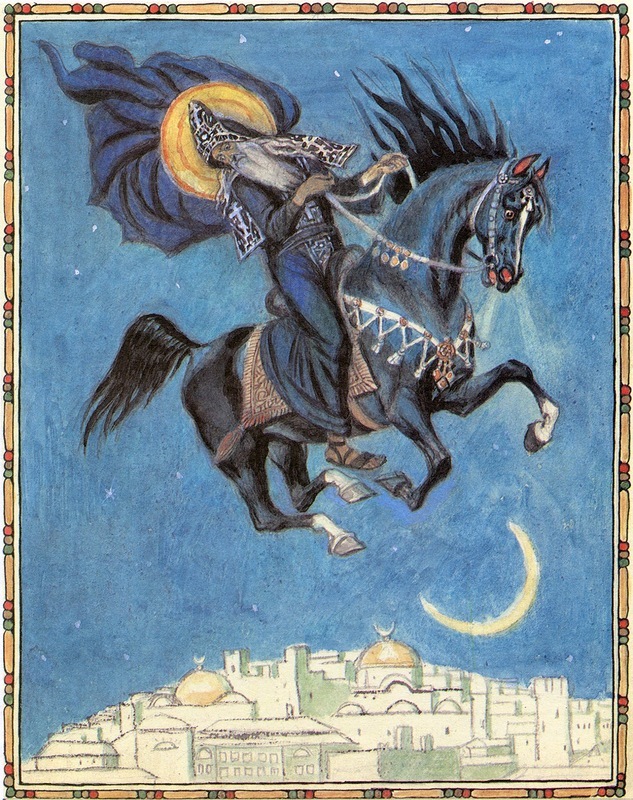 He related it as if it were a story about someone else, saying, "I know a man who in one night went to Jerusalem, venerated the Lord's Sepulcher and the Lifegiving Wood of the Holy Cross, and returned again in the same night to Novgorod the Great, riding upon a demon who had been bound like a prisoner." Those who heard this marveled greatly, but the demon gnashed his teeth at the Saint and said, "As you have related this secret, I will bring upon you a temptation which will be judged by all the citizens as fornication." And from that time, with God's permission, the demon brought upon the Saint the following temptation: to the numerous people who came to the Saint to receive a blessing, the devil would produce visions, now of women's sandals, now of necklaces, now of some other trinket or garment that women wear. The people who came were scandalized and thought evil of the Saint, imaging that he kept a harlot in his cell, and they were greatly troubled. 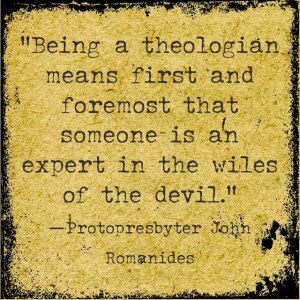 So they said among themselves, "It is not fitting that such a hierarch, who is a fornicator, should occupy the apostolic throne." Once, when the people were gathered together in the cell of the Saint, the demon transformed himself into a girl and ran before the crowds as though fleeing from the Saint's cell. The people, catching sight of the wench, cried out and ran after her, hoping to catch the girl, but the demon ran away from the cell of the Saint and became invisible. The Saint, hearing the uproar of the crowd, came out of his cell and said to the people, "What is this children? Why this uproar?" But they cried out against him, and seizing him, as against a fornicator, reviling and reproaching him, and seizing him, they began to mock him. Not knowing what to do with him, they said, "Let us take him to the river and set him on a raft so that he may float down the river and away from our city." They then took the holy and chaste hierarch onto the great bridge which spans the River Volkhov, and they lowered him onto the raft. The wicked demon's words were fulfilled which he had said in boasting, "I will bring upon you a temptation such that you will be judged by all the citizens as a fornicator." The evil one rejoiced when he saw the Saint mocked. However, since the Saint was innocent, the mighty grace of God overcame and shamed the enemy, for when the Saint was placed on the raft, it floated upstream against the very swift current that flowed beneath the bridge even though it was steered by no one but only by the power of God. The raft then floated to the Monastery of Saint George, which was located somewhat less than two miles from the city. The people, beholding this miracle, were astonished, and abandoning their ill intent, rent their garments and wept, saying, "We have sinned and have done evil, for being ourselves but sheep, we have judged our shepherd!" Going down to the bank of the river, they begged the Saint to forgive them their transgression and return to his throne. "Forgive us, Father,," they said. "Out of ignorance we sinned against you. Do not remember our iniquities, and do not forsake your children." Likewise, all the clergy came before the Saint, and bowing their heads to the ground, they entreated him with tears to return to his throne. 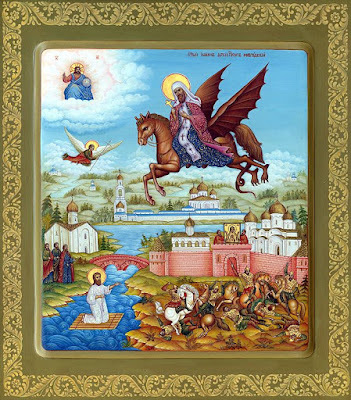 He, like a second Stephen the Protomartyr, prayed to God for those who had offended him, saying, "Lord, lay not this sin to their charge;" and landing on the shore about a quarter of a mile from the previously-mentioned monastery, he stepped off the raft and onto the bank of the river. The people fell down before him, weeping and asking his forgiveness, and when the Saint pardoned them, they were filled with joy. Likewise, they rejoiced that the Lord had revealed his life to be blameless and pure. He, being guileless, granted forgiveness to all and told them how he was the one who had ridden the demon to Jerusalem and how the devil had boasted against him, and all who heard this glorified God. Thus, the Saint returned to his throne with great honor and glory, and he taught the people, saying, "Children, try in every way not to be deceived by the devil, and do not confuse virtue with evil, thereby becoming liable to God's judgment." From The Great Collection of the Lives of the Saints, vol. 1.